The celebration of a mid-winter holiday is as old as humanity. The sadness of death and desolation that surrounded our ancient ancestors mingled with hope that the days would lengthen, the sun would grow stronger, the trees would burst into bloom, the animals would give birth, and the crops would again ensure their survival. In keeping with the mid-winter celebrations of their neighbors, the three early Christian Churches in Rome, Greece, and Egypt, assigned Christ’s birth on or near December 25 already by the 4th Century. But the Protestant Reformation began to question any celebration that was not Biblical. Luther, Calvin, Zwingli, Huss, Knox, and other reformers sought Biblical justification for saints, statues, indulgences, seven sacraments, nuns, monks, popes, and Christmas. If none was found, then they were relegated to the dustbin of Christian history. Scotch Presbyterians, Baptists, Methodists, and Quakers flatly rejected Christ’s-mass and even forbade its celebration while the Lutherans, Anglicans/Episcopalians, Dutch Reformed, and French Huguenots admitted that frail humans needed such holidays and it did little real harm even if there was no Biblical justification for it. The Dutch Reformed Church also allowed a sober celebration on December 25 but reserved the real fun for the December 6 feast of their patron saint, Saint Nicholas. 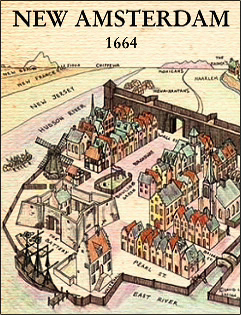 When the newly-founded Dutch colony of New Amsterdam was established in 1624 it literally threw the doors of immigration open to anyone willing to work and defend the colony from Indian, English, French, and even Spanish attacks. Soon the great Christmas controversy that divided Catholics and Protestants, and Protestants and Protestants, filled the streets and villages of the Dutch colony. Following American independence, Washington Irving argued that New Yorkers needed a nice respectable secular winter holiday. In The Keeping of Christmas at Bracebridge Hall (1819) and Old Christmas (1856) he urged Americans to adopt this Old English holiday to give the emerging culture some historical depth. Shortly later, Clement Clarke Moore transferred the long established Dutch December 6 celebration of St. Nicholas (Sinterklaus in Dutch) to December 25, relocated Santa Claus to the North Pole, hired a squad of reindeer to carry him around, and gave him a wife in his book, The Night Before Christmas. Another New Yorker who contributed to the emerging holiday season was editorial cartoonist Thomas Nast. During the American Civil War, Nast mobilized Santa as a representation of American nationalism, often portraying him wearing a blue outfit with stars distributing gifts to Union soldiers. Following the war, his Santas adopted the red outfit that we all recognize today but continued to be an expression of national pride. The growing network of public schools made the decoration of Christmas trees, the giving of gifts, and arrival of Santa part of the process of assimilation and Americanization of the millions of Italians and Eastern European Catholics, Orthodox, and Jews, not without controversy. Thomas Edison presented his first string of electric lights in 1880 and constructed the first commercial electricity generating plant in Lower Manhattan to provide power. The ancient pagan Germanic Christmas tree could now safely be brought indoors and Christmas became a popular middle class family celebration. Of course, all these indoor trees needed decorations. Into the season stepped F.W. Woolworth who traveled to Germany and signed a monopoly agreement with the German manufacturers of glass ornaments which he marketed at his growing national chain of stores. The smaller ones sold for five cents and the larger ones for ten cents, thus the origin of the five and ten-cent store. He constructed his corporate headquarters on Broadway, which reigned as the tallest building in the world from 1913-30. Another merchant who contributed mightily to the commercialization of the holiday season was Frederick August Otto Schwarz, who migrated to the city where he opened his toy store in 1870. Mercifully, he shortened the name of the store to FAO Schwarz, and by the time he died in 1911, he claimed it was the largest toy store in the world. In short order, the Holiday Season was extended when the New York Times began its famous New Year’s crystal ball drop in 1907, officially extending the Holiday Season from Christmas until New Year’s Day. Macy’s Department Store held its first Thanksgiving Day Parade in 1924, at the height of the Roaring ‘20s, with the last float devoted to Santa Claus coming to town and announcing the official beginning of the Christmas shopping season. With the Macy’s Day Parade at one end and the Times Square New Years’ ball drop at the other end, the Holiday Season was now clearly delineated. The rest of the story is simply filling in the nearly month-long season between Thanksgiving and New Year’s with almost daily celebrations. In 1931, in the midst of the Great Depression, the workers at the rising Rockefeller Center complex erected their first tree to celebrate the holiday. The lighting of the tree is now not only a major New York event, but like the Times Square Ball Drop, a national and even international event. As Baptist, Methodist and Presbyterian resistance to Christmas was worn down, many Jews also found that the growing holiday season was drawing them willy-nilly into the Christmas craze. Rather than resist, Jews contributed to the secularization of the holiday. Composer Irving Berlin, a Jewish immigrant from Russia, contributed “White Christmas” in 1942 which joined Robert May’s “Rudolph the Red-Nosed Reindeer” as Holiday Season favorites. Many Jews put up Christmas trees and Jewish children clamored for presents just like their Christian friends. Later, many Jews began to refashion the minor Jewish holiday of Chanukah into an equal of Christmas. The traditional Chanukah gelt (coins) became wrapped gifts, synagogues held lavish Chanukah parties, and the Chanukah candlestick became mandatory wherever a Christmas tree was erected in a public location. Following the Second World War in places like New York City where there were large Jewish populations, “Happy Holidays” all but replaced “Merry Christmas,” again not without opposition. The largely Baptist, Methodist (AME and AME Zion), and independent African-Americans were likewise drawn into the Christmas craze. By 1934, Harlem had become the Black Mecca but Blumstein Department Store on 125th Street refused to hire any Blacks. In 1934, the Reverend Adam Clayton Powell, Sr., and his son organized a march against the store and eventually it not only agreed to hire Blacks but featured a Black Santa, claimed to be the first in the country. But by the 1960s many in the Black Pride and Black Separatist movements began to demand a separate African-American celebration. 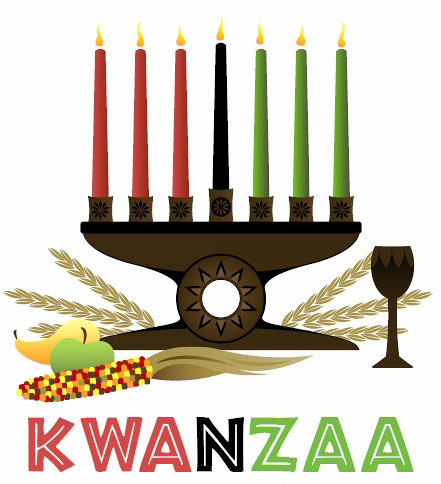 Ron Karenga created the holiday of Kwanzaa in 1966 that drew on African traditions and ideals to fashion a week-long holiday from Christmas Day to New Year’s. Still another holiday was added to the growing Holiday Season. Like a bulldozer, the Holiday Season roared through the city, the nation, and even the world, overcoming religious and cultural opposition, absorbing racial, ethnic, and religious groups into the season, and adding holidays to the season like decorations on a Christmas Tree. When the Reverend Sun Myung Moon founded the Unification Movement in 1954, like all new religious movements, the church was in need of festive occasions to bring members together, inspire their work, reinforce their beliefs, and have a celebration. In 1968, he established True God’s Day to be celebrated on January 1. At the stroke of midnight, all heads bowed and the first moments of the year were spent in prayer. Reverend Moon would then write the motto in Korean to inspire work for the year, followed by his midnight and morning addresses to the congregation. A table of fruit and candy is prepared to represent the abundance of all things that members share with God and each other. In 2010, Reverend Moon decided to switch the holiday to the lunar calendar which usually placed it in February, well beyond the scope of the Holiday Season. Unfortunately, the celebration has lost much of its importance with this switch. Of course, shopping remains a major, if not the major, preoccupation of the Holiday Season. When the First Presbyterian Church on Fifth Avenue finally decided to permit the celebration of the non-Biblical, pagan-inspired holiday, in the late 1800s, the then pastor argued that he could no longer resist the clamoring for gifts and a festive tree from the children in his Sunday School class. By 1975, Black Friday, the day following Thanksgiving, had become the most profitable day of the year for most stores; later, Cyber Monday joined the lineup, and now Grey Thursday is clamoring for admission to the shopping spree. The Winter Solstice, the shortest day and longest night of the year, has been celebrated by humans ever since the stone age. This pagan holiday officially joined the roster of Holiday Celebrations in 1979 when the Cathedral of Saint John the Divine presented its first Winter Solstice Celebration. Ironically, the very reason that the early Christians adopted December 25 as the day to celebrate the birth of Christ was because throughout the Roman Empire, residents celebrated the festival of Saturnalia, when they prayed for the return of the Sun and the success of the following planting and harvest season. It is as if the cathedral has returned to the pagan roots of the Holiday Season. Dr. Ronald J. Brown is Assistant Professor of History and Political Science at Touro College in New York City and Faculty Adjunct in World Religions at UTS. He received a Ph.D. in International Relations from the University of Geneva, Switzerland, an M.T.S. in World Religions, Harvard University Divinity School, and an M.A. in Modern History, Hebrew University of Jerusalem. He is the author of three books on New York City religious history and is working on a book entitled, How New York City Invented the Holiday Season. 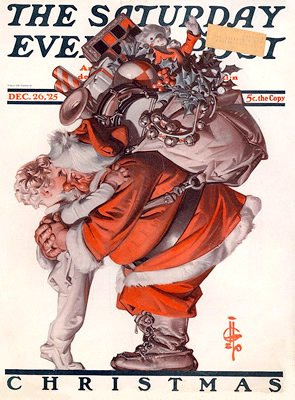 Photo at top: The cover of the Saturday Evening Post of Dec. 26, 1925. I have received this comment several times. Would “Scottish Presbyterians” or “Scots Presbyterians” be more correct? Would you accept the term “Scotch-Irish” or should that be “Scottish-Irish” or “Scots-Irish” in reference to the ethnic group? How does “Scotch tape” figure into this question? You gave us a very informative history that some of us did not know. And, I agree with you about God’s Day not having the emotional significance that it did on Jan. 1st. Families used to feel an excitement from both the holiness and the festivities. On Jan. 1st, we had some spectacular entertainment at the Manhattan Center. Those who had the mission then, such as Steve Honey and Richard Cohen, produced professional plays such as “Fiddler on The Roof” and “Man of La Mancha.” Sunburst and individual musicians performed. Although we have lost that era of Jan. 1st God’s Day, perhaps celebrating Christmas will be emphasized more, as it was in Las Vegas this year with the American Clergy Leadership Coalition, without the competing focus on God’s Day. Interesting comments. I Googled “God’s Day” and found that there were several U Churches that did still celebrate it on Jan 1. I hope to develop this blog piece into a longer article for the Journal of Unification Studies and would welcome any information on the Manhattan Center celebrations you attended, even with photos. I would like to include this information in the article and a possible future book. Adding adjectives or new embellishments to old, even ancient traditions should change nothing. Perhaps it is even true that such is the case. It would seem, however, that (the telling of) history and the subsequent imparting of tradition(s) remains ever-changing, ever-adaptive and ever subject to the whims (and personal, cultural context) of the latest, greatest storyteller. May God bless them (us) all. As a historian I find that this constant adding to ancient traditions is thrilling. I’m sure that our caveman and cavewoman ancestors celebrated their form of mid-winter, shortest day and longest night of the year in their own way. Add the story of the Jewish temple, add the Birth of Jesus, and in the future add still more historic events and the story of the Holiday Season goes on. Shortly before Christmas this year, a Christian friend of mine called me to confide that she had always hated Christmas (yes, that’s right. It is a Christian, not an atheist, who hates Christmas.) Regardless of her personal reasons, her raw honesty sheds light on what Christmas and the “winter holiday” season might mean for many. As Professor Ron Brown’s essay explains, the cold, lengthy “winter solstice” evoked the Roman longing for the sun and the new plants emerging into harvest. Celebrations are needed to help us through the end of the year, until the new year comes. Hence, the celebrations of Christ’s birthday and St. Nick’s birthday were juxtaposed with the new year beginning…out from this winter solstice. Then, the dying of winter is accompanied by images of rebirth in Christ and in the New Year, for Christians and non-Christians respectively.